OrganoClick has been granted SEK 2.3 million by Vinnova for the development of a biocomposite material for furniture and furnishings in public spaces. 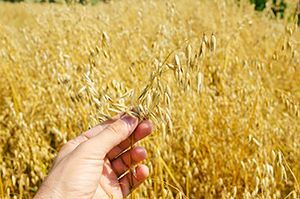 The biocomposites will be based on oat husk from agricultural side-streams in combination with OrganoClicks binder and fiber moulding technology. By using OrganoClick®'s technologies and knowledge in development of bio-based materials, the goal is to develop prototypes of furniture and interior design, which will be evaluated together with the other project partners in a variety of aspects, such as functionality, sustainability and cost-effectiveness. An important prerequisite for the conversion from fossil-based to bio-based materials is that the products are attractive to end customers from an overall perspective. Bio-based products often face the challenge of beeing more expensive than the corresponding fossil-based products. By, as in this project, starting from utilizing waste from agricultural sidestreams that would otherwise be incinerated, there is potential to create not only an environmentally attractive product, but also a cost advantage for the bio-based fiber-moulded products. The combination of attractive design, excellent sustainability profile and a reasonable cost profile can pave the way for even more successful bio-based products. In the project, Lantmännen will participate as a raw material supplier and primary processor of the raw material (oat husks), OrganoClick® as material and process developer (biocomposite and fiber moulding), Offecct as developer and manufacturer of interior products, and ÅF as property owner with the ambition to provide functional and sustainable work environments in their real estate. The architects Sandell & Sandberg and Studio Stockholm work with the design of the products and the working environment. NiNa Innovation leads the work in the project. Total funding from Vinnova is SEK 3.5 million, of which OrganoClick® will receive SEK 2.3 million. The funding comes from VINNOVA's program Bioinnovation, where the vision is to transform Sweden into a bio-economy by 2050. The project will be carried out for three years starting in June 2017. OrganoClick AB (publ) is a public Swedish cleantech company listed on Nasdaq First North. The company develops, produces and markets functional materials based on environmentally friendly fiber chemistry. Examples of products that are marketed by OrganoClick are the water-repellent fabric treatment OrganoTex®, the flame and rot-resistant timber OrganoWood®, green biocomposites branded OrganoComp®, biobinders for nonwoven materials and BIOkleen®s cleaning and maintenance products for house and home. OrganoClick was founded in 2006 as a commercial spin-off company based on research performed at Stockholm University and the Swedish University of Agricultural Sciences within environmentally friendly fiber chemistry. OrganoClick has won a number of prizes, such as "Sweden's Most Promising Start -up" and "Sweden's Best Environmental Innovation", and has also received a number of awards, such as the WWF "Climate Solver" award and has also appeared for two years on the Affärsvärldens and NyTekniks list of Sweden's top 33 hottest technology companies. OrganoClick has its head office, production and R&D located in Täby, north of Stockholm. OrganoClick's Certified Adviser on Nasdaq First North is Erik Penser Bank.